A "dog for the kids" will be a non-critical confidant to share a child's dreams and teach responsibility in caring for the dog. Unlike most lists of best dog breeds for the family, we explain WHY certain breeds are better suited for kids. A lot depends on the child's AGE group, activity level, and personality. The really cool thing about purebred dogs is that each breed was developed to serve a certain purpose, like to be a ladies lap dog or guard the Emperor's palace. When a pure breed gets crossed up with another pure breed for a specific reason, we call it cross-bred. When a pure bred dog gets accidentally mated to a mutt, well, we call it a mongrel because the carefully developed traits of the purebred are diminished by the mutt's jumbled up genetic traits. 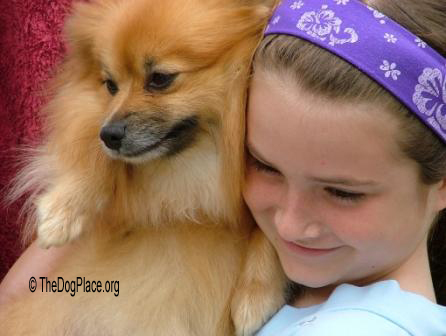 One thing all dogs have in common is an uncanny love for humans. Puppies love everyone but as they get older their genes "come alive" and begin to distinguish their breed characteristics. Some breeds become devoted to just one person, some become very territorial and will protect your stuff. Others, like terrier breeds, become "varminty" (meaning they catch pesky critters like rats) and most terriers breeds are fiery and quick to react. 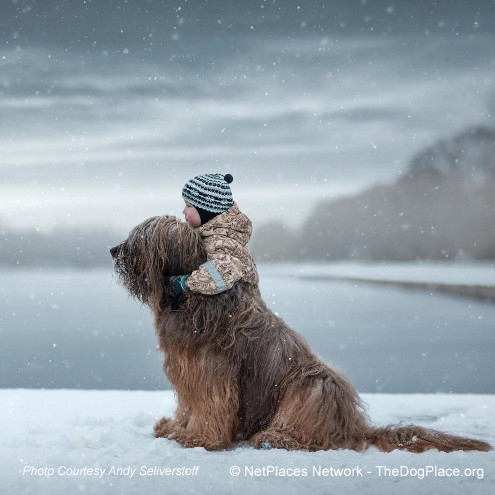 Some breeds are known to be "made for kids" but don't limit your choices. 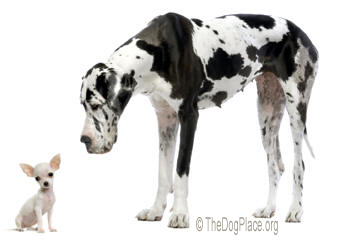 Keep size in mind so a toddler doesn't get "run over" by a big breed. Also remember that territorial, protective breeds may not always accept youngsters running in and out. But there are exceptions because each dog is different and age brings wisdom to temper the aches and pains elderly dogs experience. This old Great Dane adores the new family member. Terrier breeds tend to grab toys and even ankles but they are energetic and great with older, athletic kids approaching their teen years. Some breeds are made for children. Many of the Herding breeds happily take on the duty of keeping the kids rounded up and watching over them. Be watchful for those breeds that instinctively "nip at the heels" so they don't trip your toddler. Do your research. See "Dog Breeds" section below so you can learn how the American Kennel Club defines each breed according to the AKC Dog Breed Standards. You might consider some of the "Non-Sporting" breeds like the Bulldog. They are patient, slow to anger, have a high pain threshold, don't mind being dressed in doll clothes, ridden in a wagon, or being a pillow in front of the TV. They seem to be especially made for young children whereas other breeds are are great for older kids. 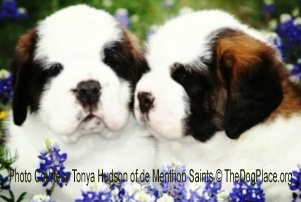 Remember that big breeds age faster than small breeds but choosing a purebred gives you the assurance of adult size, lifespan, patience, gentleness, the special designation "good with kids" that fits so many breeds that you will have many wonderful choices. ARF! Clumber Spaniel. Clumbers are big enough, gentle and patient enough to resist rough handling, making them a good choice for families with toddlers. With older children, the Clumber will just snooze quietly when homework is the priority. ARF! Cocker Spaniel. Cockers are loving and tolerant of having coat or ears pulled by rambunctious and mischievous youngsters who are a tad more active. ARF! Golden Retriever. Goldens are fun-loving, intelligent playmates for children of every age; from the old five year old who runs in circles with exuberant energy to the teenager who expects his dog to be end receiver in a rough and tumble game of football! ARF! Labrador Retriever. 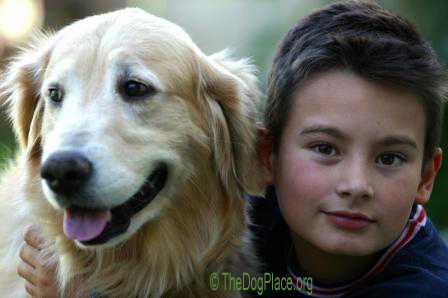 Labs are sturdy, sensible, thoughtful - what we call a "good buddy dog" for all kids regardless of their age. Their size and sturdy nature combined with energy level to match that of any kid makes them among the most popular family dogs. ARF! Bernese Mountain Dog, Newfoundland, Irish Wolfhounds. 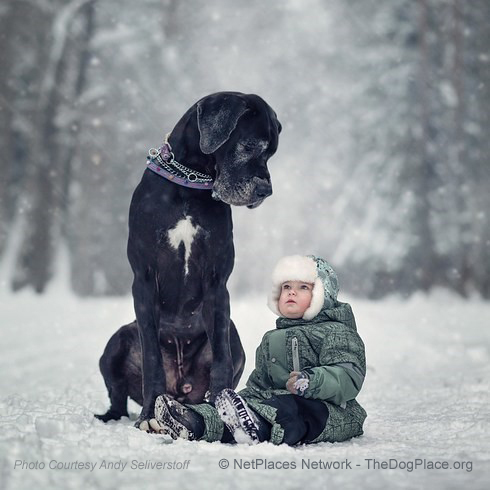 Those who want a really big dog and whose children are old enough to avoid being jostled by over a hundred pounds, simply love these gentle giants. They are good natured, tolerant, sedate companions. ARF! Boxer. Kind, loving and loyal, the boxer is a great dog for boys who like to rough-house and roll around in the dirt with their best friend. Fine for younger kids, too, if obedience trained as the dog's eagerness to play could overwhelm toddlers. ARF! Boston Terrier. Bostons are so tuned in, alert and quick on their feet that even a falling tot isn't likely to land on one. Small enough to go everywhere, not a dog to nip or bite. Loving, loyal and energetic enough to keep going and going and going - like the Energizer Bunny! ARF! Bulldogs. These powerful dogs have a very high pain threshold and therefore react to the poking and prodding of toddlers with a big wet kiss or the kind of "ho-hum tolerance" that keeps mothers breathing easy. ARF! Shetland Sheepdog. Quick on their feet with equally agile minds, Shelties are bred to stick to their charges like a magnet and to gently protect babies, whether lambs or humans. Enough said! ARF! Toy Fox Terriers. Families looking for a playful armful get exactly that with this little "circus dog" that loves to entertain both children and adults! He's also a reliable burglar alarm, is healthy, hardy and needs very little grooming. Smart as a Chihuahua, agile as a terrier. ARF! Beagles. These pint-sized hunting dogs are affectionate and sturdy. Not big enough to intimidate a little child but large enough to keep a kid from trying to pick them up and squeeze too hard or drop the dog. ARF! Bloodhounds and Basset Hounds have lots of loose skin to intrigue children, long silky ears everyone loves to stroke, and as much calm patience as they have drool. And well, that's a lot! DOG BREEDS FOR ALLERGY OR ASTHMA SUFFERERS Medical fact: learn why dogs are good for the developing immune system (children) but some breeds are better for people who already suffer from allergies. To see photos, descriptions and official breed Standards and learn more about these "good with kids" breeds, visit the DOG BREEDS SECTION. 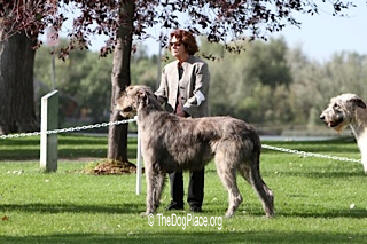 You can click a breed by name, by the ABC method, or browse breeds by their group which lets you check them out by size, weight, coat type and purpose. How cool is that!! Big or small dog, watchdog, lapdog, short or long coat? A canine best friend is an important life decision.